We Solved Net Neutrality: “$400 Billion Broadband Scandal” Is the Evidence. We Uncovered a Fatal Structural Flaw in Every FCC Proceeding. 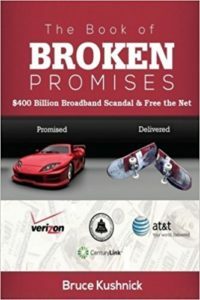 We have found a fatal structural flaw in every FCC proceeding and ironically, “The Book of Broken Promises: $400 Billion Broadband Scandal & Free the Net” (3rd book in a trilogy that started in 1998), supplies a large part of the evidence. Subject: Bruce Kushnick: We Solved Net Neutrality: We Uncovered a Fatal, Structural Flaw in Every FCC Proceeding. We just made a rather startling discovery. We uncovered a structural flaw in every FCC proceeding. Simply put: The FCC has never examined or acknowledged any state-based data in every current FCC proceeding, or in any section 706 broadband process report– ever. The FCC can’t preempt state laws; it doesn’t have the evidence. Title II did not harm investment. In the states, Verizon uses it to deploy FiOS and have local phone customers pay for the wireless deployments. And the FCC’s ‘shut off the copper’ analysis never mentions there is a state-based utility or gives an accounting of ALL lines… and it goes on and on. 1) We are giving away “The Book of Broken Promises”, which is part of the evidence — Feel free to make it available to your clients, readers and viewers, elected officials, reporters, etc. 2) We wrote a separate report that is part of a new series.— Attached. 5) We are planning on appealing the FCC’s Net Neutrality decision and some of the other FCC current proceedings based on our findings. 6) We are already part of an appeal of an FCC decision on ‘Business Data Services’ with Public Knowledge & Consumer Federation, and our research helped to create an investigation of Verizon NY pertaining to cross-subsidies; Verizon is now in settlement discussions. This summary article is on Medium.